You know that verbs are significant part of a sentence, without which a subject cannot make a sense in a sentence. In English basically there are three types of verbs: 1.The Action verbs or Normal verbs that are usually physical actions which you can see somebody doing. 2. The second group, called “Non-Continuous Verbs,” is smaller group. These verbs are usually things you cannot see somebody doing. 3. The third group is the mixed verbs. These verbs have more than one meaning. In a way, each meaning is unique. Some meanings behave like “Non-Continuous Verbs,” while other meanings behave like “Normal Verbs.” They are divided into different types according to their functions and forms. 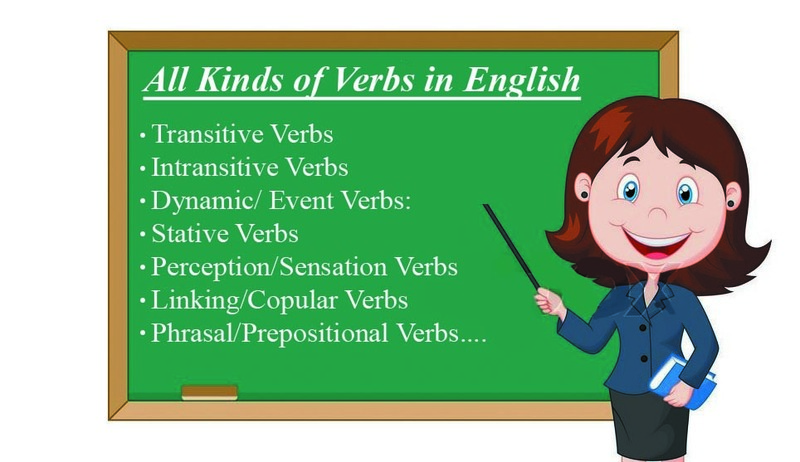 In the lesson below we will talk about 12 kinds of verbs in English. 1. Transitive Verbs: Transitive verbs are action verbs that have an object to receive that action. 2. Intransitive Verbs: Intransitive verbs are actions verbs but unlike transitive verbs, they do not have an object receiving the action. Some verbs like (cheer, sing, visit, trip) can be transitive or intransitive, depending on how they are used in a sentence. They are playing in the playground. 4. Stative Verbs: The verbs that express a state rather than an action. They usually show mental feelings, emotions, state of a person, place, relationships, sense and measurements. I am feeling your sadness. Some verbs like: verb to be, think, have and see can be both stative verbs and dynamic verbs depending on their meaning. 5. Perception/Sensation Verbs: The verbs which show our five senses are called perception/ sensation verbs. 6. Linking/Copular/Predicating Verbs: Linking verbs do not express action. Instead, they connect the subject of the verb to additional information about the subject. These verbs are usually followed by an adjective or a noun. The following verbs are true linking verbs: any form of the verb be [am, is, are, was, were, has been, are being, might have been, etc. ], become, and seem. These true linking verbs are always linking verbs. Then you have a list of verbs with multiple personalities: appear, feel, grow, look, prove, remain, smell, sound, taste, and turn. Sometimes these verbs are linking verbs; sometimes they are action verbs. 7. Phrasal/Prepositional Verbs: The verb which is formed by the combination of a preposition or adverbial particle is called Phrasal/prepositional verb. Because a preposition always has an object, all prepositional verbs have direct objects. He is looking after the dog. They are talking about the issue. 8. Modal Auxiliary Verbs: Modal verbs are words like can, could, may, might, shall, should, will, would, must, ought to etc. They are used with other verbs to express ideas such as possibility, prediction, speculation, deduction and necessity. Or modal verbs show different moods and attitudes of the speaker. The weather may be colder tomorrow. Click here to learn more about modal auxiliary verbs. 9. Helping Verbs/Auxiliary Verbs: Auxiliary (or Helping) verbs are used together with a main verb to show the verb’s tense or to form a negative or question. The most common auxiliary verbs are: have, has, had, do, does, did and to be verbs. Have they completed the assignment? Ali is writing an e-mail to a client at the moment. 11. Causative Verbs: In causative verbs we do not perform an action directly, but we get it done indirectly by someone else means by the second person. The formula will be changed according to the absence or presence of the second person. English has three true causative verbs: let, have, make, but there are other verbs such as cause, allow, help, enable, keep, hold, force, require and persuade indeed which are not causative verbs but similarly used as causative verbs. Click here to learn more about causative verbs. He gets Ali to wash his car. He has Nadir help him. Regular Verbs: Regular verbs are those verbs whose past tense and past participle (2nd and 3rd forms) are formed by adding “d” or “ed” to the end of the verb. Irregular Verbs: Irregular verbs are those verbs that do not take ‘ed’ ending for their past tense and past participle (2nd and 3rd forms). Click here to learn more about regular and irregular verbs. Well done your are doing great job.You made my concept clear about pronoun and verb. It is very useful. Keep it up. He is looking after the dog (He takes care of the dog). You are welcome Lokesh, hope it is helpful. Thank you Amanullah.We don’t have yet, we are working on this service. I think what you call perception verbs are still stative verbs.Verbs are the most abused parts of speech.They are the most problematic.Language experts,on a daily basis,try to find new ways to explain what the verb is and does,especially when it is an obligatory element of a sentence.Thank you for sharing. The best information I have ever studied about grammar. Thanks a lot. is these types are according to structure and function? Yes, they are according to the structures. Learningful activities …thanks a lot … If you can help with some English language lessons activities softwares by emailing . Thank you for appreciation, and working on the software, soon it will be live.